It’s time to give our guide on the Best Aerobeds (and their reviews) a proper overhaul. It’s been two months since we updated this guide, and the alarm is going off, no matter how many times we hit snooze. Aerobed is well known around the office for its stingy product specifications, but also cheap and high-quality air mattresses. We’re in for a doozy. 5.2 How it’s currently rated – by quality categories and overall? 8.2 What users didn’t like about this Aerobed? 9 Is the Premier worth the money? 13.1 What are the consumers saying in their reports – the PROs? 14 The bottom line of the review? 19 Is this Aerobed worth the money? Very little, at least, in terms of the products on our list of winners. It’s a spitting image of two months ago. Luckily, we have a ton of new info to share, and we’re not selfish with our air mattress findings. We did a couple of new tests with some interesting results, contacted a lot of recent customers for their exclusive opinions and experiences and had a fruitful cooperation with a couple of our featured testers. Bottom line, there’s a lot of new things to read, even though it didn’t appear that way on the first glance. Height 20 " 18 " 9 "
Now we can scratch beneath the surface and see what makes these specific models tick. For our first-time readers, digest reviews are just shortened versions of our regular product reviews. Now that the ropes have been shown, we can start dissecting these portable beds one by one. Our once-and-future winner among its peers, AeroBed Premier has been the inflatable bed to beat for the past, well, countless updates. Let’s take a thorough look under the hood. As we said, stingy and terse. If you ever see an S&T abbreviation anywhere on 3 Beds, this is where it originated. How it’s currently rated – by quality categories and overall? What users didn’t like about this Aerobed? Is the Premier worth the money? AeroBed Premier has its flaws, but they’re heavily outmatched by all the good stuff it has to offer. The two most notable disadvantages are motion transfer and the overall weight of the mattress. Motion transfer is a real problem if your partner tends to twist and turn a lot throughout the night, no issues there. On the other hand, air mattresses are pretty heavy in general. The weight increases with the size, so AeroBed in Queen Size will make you feel it. Having said that, our tests have shown pretty amazing results. The bed had to struggle its way through our new and improved pressure test, followed by intensified versions of tensile and puncture tests. You’ll be able to read all about those results in our separate “test results” article. As far as the recent buyers are concerned, the feedback is overwhelmingly positive, comfort, durability, solid construction, air retention, design being just a few points to receive high praises. Only one conclusion can be reached after we’ve heard all this. AeroBed Premier is one sweet deal, judging by the customers and a slew of tests we subjected it to. Not to mention the highly budget-friendly price. This Aerobed has an official 3Beds Seal of Approval, especially in the value for money category! One of our evenly matched AeroBed Classic representatives, which had the whole crew convinced it could outmatch its low-rise counterpart this time around. Somebody lost that bet (said the author rubbing its wallet with a sad look on its face). Again, AeroBeds are the kings of short and not-too-informative specifications. Again, we have our ways of getting to the bottom of things (especially our wallets when making ill advised bets). What are the consumers saying in their reports – the PROs? I bought 10 of these for my construction workers in whatever temporary accommodation they’re sleeping at any given moment. We’ve been tugging the along for more than three months now, and all of them still do the job perfectly. Best investment ever! The bottom line of the review? This model add one more CON to the mix. You might find it weird that people are complaining about the “cheap-looking” design, but we as a team understand their woes. If we’re spending the money, no matter the amount, we want to get something, at least, professionally made/looking if not pretty. That point is lost on this model and it really doesn’t look like much. Last but not least, its coming from a reliable company. So, if you’re looking for a “pretty” and surgically made air mattress, definitely skip on this model. Other than that, everything else is just where it needs to be. Recent buyers number a great deal of things done right about it that the unfortunate end design doesn’t seem like that big of a deal anymore. But we’ve seen it already in our section dedicated to user reviews. What we haven’t seen so far are the test results for this model, and you’ll be able to read all about that in the separate upcoming article. Little hint, the looks are counter proportionate to its performance. Bottom line, this is not the best Aerobed, but it’ll definitely get the job done, which is more than a good deal for such a (ridiculously) low price. Last item of the day is basically the low-rise version of the previous model. They have the same scores in all of our categories and tests, but the tie-breakers were in favor of the double-high once again. We can skip the part with the product specification since it’s the same as the previous one. The only thing that’s different is the height, obviously. This model is 9 inches high, which makes it a low-rise model. Depending on the purpose, people usually prefer higher models, which indicates air mattresses are being bought more and more for home use. It used to be all about camping with these bad boys, and see how the times have changed. We already sort of know what we’re dealing with, so let’s head straight over to user feedback. We bought two of these, and since they were our first air mattresses ever, we didn’t know what to expect in terms of storage space needed. Turns out, I can stuff both of them into a single carry bag out of the two that we got when we bought them. Storage conundrum solved! Is this Aerobed worth the money? 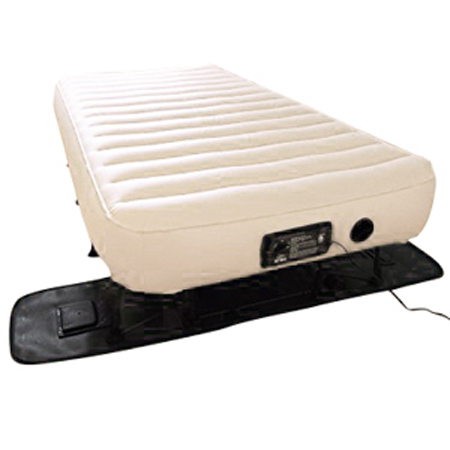 There’s not much to say about this air mattress that we haven’t said already in the previous digest review. They’re the same model, just different heights, so everything stated there is also applicable here. It’s still the same design vs. performance type of deal, so I guess we’ll have to weigh one against the other. There is one difference, however since we can apply one test to low-rise mattresses that we can’t to high-rise, but we’ll delve deeper in our separate article about test results. Until then, all that’s left to say is that this is one excellent air mattress when we put the price into the mix. Very few airbeds out there can beat this quality at the current price. So, if you’re on the market for the cheap yet decent quality air mattress, this might be your last stop. Another Aerobed deserves an honorable mention here because it’s just as good (if not better) as any of these, but we didn’t include it in this guide because of the price tag – we’re talking about the Aerobed Double High in King Size. So, we brought in a bunch of new info, fresh user reviews and test results hot off the press. We think there will be enough material to go through before that alarm start going off again. Have fun searching for your best AeroBed inflatable mattress and see ya in time for the next update.